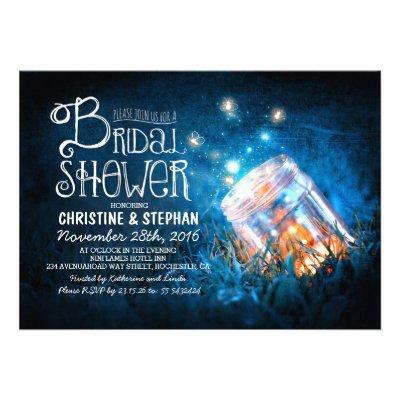 Blue bridal shower invitation inspired by enchanted and romantic outdoor bridal shower celebration. Casual, rustic and whimsical bridal shower invite for modern yet vintage bride to be. Romantic and dreamy choice for those who love fireflies - little night lights and planning bridal shower design with mason jars. ----If you push CUSTOMIZE IT button you will be able to change the font style, color, size, move it etc. it will give you more options! Contact me if you need more matching items or have a custom color request.